Alkaline earth metals are a group of highly reactive elements placed right next to the alkali metal group. Although all the alkaline metals are found in nature, their high reactivity prevents them from occuring freely or in their pure form [1, 2]. These belong to Group 2 (the one following with alkali metal group) in the periodic table, with all the alkaline metals lying in the s-block [3, 4]. The alkaline metals are named as such because when mixed with water, they produce solutions with pH higher than 7, and ‘basic’ or ‘alkaline’ properties . Additionally, they are found in the earth’s crust and are not affected by fire or heat . All the alkaline earth metals are highly reactive, though not as much as the alkali metals . The energy required to make an atom give up the electrons in its outermost shell (valence electrons) is the ionization energy for the element. The lower the ionization energy, the more reactive an element is. Since all the alkaline metals have only two valence electrons, it takes little energy to make them give up those electrons to form cations (2+), resulting in high reactivity . 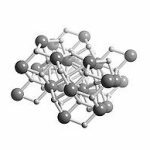 Beryllium (Be) does not react with water due to its small atomic size and relatively high ionization energy . Be and Mg are widely used in the production of alloys useful in industrial constructions including heat-resistant factory tools, as well as automobile and airplane parts. Ba has applications in various medical and diagnostic procedures like X-ray and MRIs (barium meals). The most important use for Sr is in the production of fireworks as it helps create the colorful flares. Apart from radium, the Alkali earth metals are also used in flashbulbs and batteries. Radium, being a highly radioactive element, does not have any industrial applications at present. Earlier, it was used in luminous paints and watch dials [1, 9]. Mg and Ca has vital functional and structural roles in both plant and animal physiology, with Mg being present in chlorophyll molecules, while Ca is one of the primary constituents of bones. Additionally, SR is essential to the survival of a number of marine creatures, primarily various hard corals, as the element helps in shaping their exoskeletons [1, 5]. Q 1. What is the lightest alkaline earth metal? Ans. 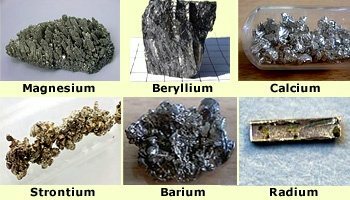 Beryllium is the lightest element in this family, having the smallest atomic radius. Q 2. What is the heaviest alkaline earth metal? Q 3. What are the most common alkaline earth metals? Q 4. What are the main differences between alkaline earth metals and alkali metals? Ans. The alkali and alkaline earth metals do have some similar physical properties, but the main difference between the two is the number of valence electron. Alkaline earth metals have two valence electron, whereas alkali metals have just one. This makes the former less reactive than the latter . The alkaline earth metals are the most reactive element family after the alkali metals . The first and last element of Group 2, Be and Ra, are both toxic to living organisms . All the six elements produce colored flames when burnt: a bright white for beryllium and magnesium, red for calcium and radium, crimson for strontium, and green for barium. Four of the six alkaline earth elements are known to have been first isolated by English chemist Sir Humphry Davy .